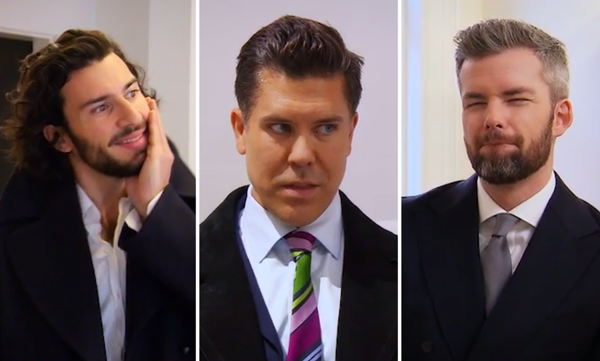 In this week’s episode of “Million Dollar Listing New York,” our property pals are faced with a choice: Get played, or do the playing. Ryan juggles a pair of Upper West Side Townhouses On The Very Same Street, while Steve struggles to get an apartment in tip-top shape before showings. Fredrik, meanwhile, taps his fashionable and famous friends to unload the final unit at a development in Soho. With things looking pretty good in Brooklyn, where his team has sold 73 out of the 100 buildings in Brett’s portfolio, Ryan points his beard westward to a pair of Townhouses On West 87th Street and Central Park West. The first — a six-story, 6,414-square-foot townhouse — is like taking a step (or two) back to 1884. There are so many original details for the seller to get through that Ryan is late for a second listing appointment just a few doors down. This next one, also from the late 1800s, doesn’t have an elevator or finished roof deck, but it’s closer to the park and is 3 feet wider than its counterpart — and in New York City, every extra foot counts. The townhouses are priced at $11.5 million and $9.9 million, respectively. “I own this block,” Ryan says. It would seem that scoring $22 million worth of listings within spitting distance of each other would play out well for Ryan. But as we know, double the fun sometimes means double the trouble. Ryan decides to list the more expensive townhouse first. This is a smart move until he starts funneling potential buyers who seem to be “more suited” for it to the wider, less expensive townhouse down the street. David, the seller of the $11.5 million pad, discovers that Ryan is trying to unload another home on the block, and obviously feels betrayed by this listing on the side. For him, it’s not so much that the act has taken place. It’s the fact that Ryan wasn’t upfront about his … indiscretion. If this sounds like a bad romance novel now, we can’t wait until David finds out Ryan’s put his townhouse on the backburner! With low-calorie margaritas in his rear-view mirror, it seems like Fredrik has arrived at a dead end. That is until Renee, a model who passed on the building’s penthouse just an episode ago, drops him a line out the blue. She wants the apartment for $500,000 less than its asking price, with finishes of her choosing — and she wants it now, darling. Fashion waits for no one, after all. This is a touchy subject, considering Michael Kirchmann, the developer, also designed the project. At first, he’s unwilling to let her customize the space on top of a $500,000 price cut. But if there’s one thing we’ve learned about developers on “MDLNY,” it’s that they appreciate the finish line just as much as they love their money. Having accepted a full-ask offer for the townhouse, Michael is willing to compromise for the sake of selling out the development. Or not having to work with Fredrik anymore. Or probably both. The episode kicks off on a positive note for Steve and his abs, who are called upon to sell a three-story townhouse in Greenwich Village. As if it were that easy! Though the home comes with an attached garage — the golden ticket in New York City — the space is completely raw. On top of that, Steve agrees to sell it for $12.75 million in 30 days … though we’re unsure if he manages to hold on to the listing for 24 hours. It looks like Ian, the developer’s representative, took his advice to finish and stage the pad to heart, and has decided to take it off the market to do so. For whatever reason, this means Steve can’t have the listing, bro. So much for that free staging advice! Steve’s efforts weren’t all for naught, however. Ian offers him a massive, third-floor unit at the development, which is a pretty good consolation prize. This $8.95 million apartment is also bare bones, and it takes a little bit of wrangling to convince the developer to stage the place. It seems like he’s going to pull through … until Steve walks through the door with his first pair of clients and surprise! The place isn’t staged. You think he would’ve learned to not trust anyone to follow through on their staging promises while dealing with the Steves, but alas, here we are again. Steve rings Ian to inquire about the missing furniture, and the call goes exactly how you’d expect. “Why are you crying to me about this sh– bro,” Ian says. Bro. Bro! There’s no crying in real estate, bro! But to be fair, no tears were shed in the making of this episode.